The visualisation shows cooperation is strong in nano and materials, but that most money flows in the climate area. 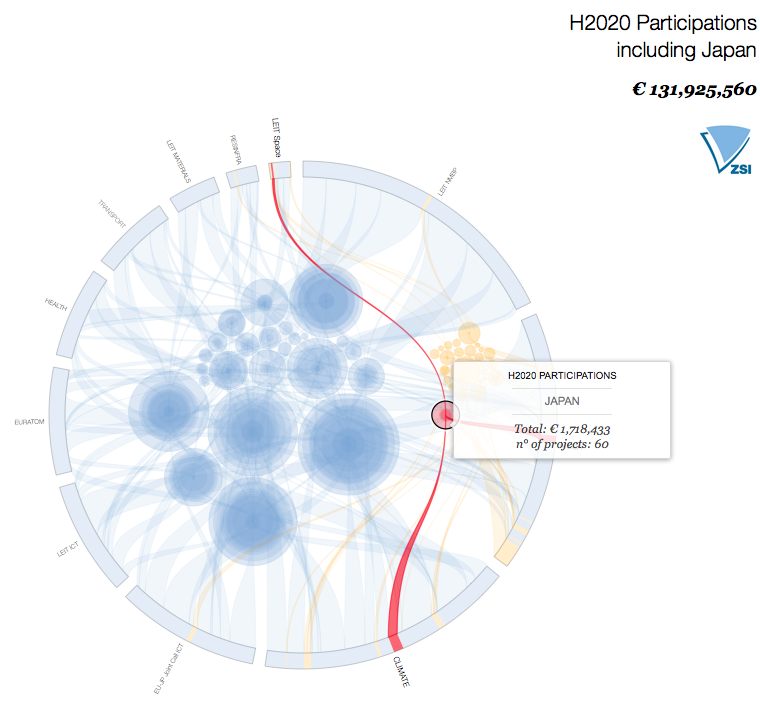 As part of our work in the JEUPISTE project, we have visualised H2020 participation of Japan-based participants. The web-based tool illustrates the EC contributions in Horizon 2020 projects with participation from Japan. Tooltip information also shows the number of projects in each thematic area. The visualisation shows that the cooperation is strong in nano and materials, climate and the MSC actions. EC contributions to Japan are strongest in the area of climate. Spain and Italy feature strongly in the cooperation, the former in the area of climate, the latter particularly in nano and materials. The visualisation builds on eCorda (January 2017) data processed by the Catalan Agency for Management of Universities and Research Grants (AGAUR) in Barcelona and analysed by the EU-Japan Centre for Industrial Cooperation, AGAUR and ZSI.